The Secret History Behind the Flash's "Speed Formula" and "Time Wraith"
Last night’s episode of The Flash “Flash Back” perfectly illustrated how a TV show can completely recreate the feel of its comic book source material. Where so many adaptations fail in their execution by being slavishly devoted to the source material, and this episode could have done that, this episode succeeded with red and yellow speeding colors. “Flash Back” perfectly took key ideas and story lines from the comics and made one hour of what, for me, was the first time I fully felt the exact same way I do when I read the old back issues of the Flash comic book from the Waid and Johns (truly classic) Wally West era. That was exhilarating as a fan of both mediums. But where did the speed formula actually originate in the comics? And whose appearance was that time wraith really most closely emulating? Golden Age speedster Johnny Quick belly-flopping into action. “The speed formula” first appeared in 1941 debuting with the Golden Age speedster Johnny Quick, and it is by reciting the speed formula “3X2(9YZ)4A” that Quick gains his powers. The power works as “his brain could tap into a higher dimension, which he usually thought of as the fourth dimension of time, and draw an unspecified speed-energy from that dimension and directly harness and use it.” He is significantly slower than Golden Age Jay Garrick via this mathematical methodology to being a speedster. Quick encounters Garrick, who also debuted in 1941, and the JSA more than once during that era and gets involved in time paradoxes during his appearances, time paradoxes not dissimilar to those explored in this episode. Johnny Quick (secret identity Johnny Chambers) taught his daughter Jesse Quick the speed formula. Jesse’s mother is another Golden Age hero: Liberty Belle. That’s a much closer match to Max Mercury’s look than any other speedster. The smooth round dome of the head, the large domino mask effect over the eyes both leaving the rest of its head uncovered. Perhaps most importantly, there are no “Flash” lightning bolts protruding from either side of the head. The resemblance screams Max Mercury. Max Mercury’s consistent involvements in time paradoxes screams “this is the one speedster most likely to get trapped in the time travel corridor of the Speed Force.” And finally, in the comics, after his death, Max Mercury’s spirit does become trapped in the Speed Force as a form of afterlife. Even if it’s just a very elaborate easter egg, and that’s the direction in which I’m leaning, it’s an incredibly well-crafted, very smart easter egg. And creating incredibly well-crafted, very smart easter eggs is something the Flash TV show’s makers excel at doing. In fact, they outdo themselves constantly, as we the viewers have seen show after show, season after season. Who knows? Maybe Max Mercury will never be referenced. 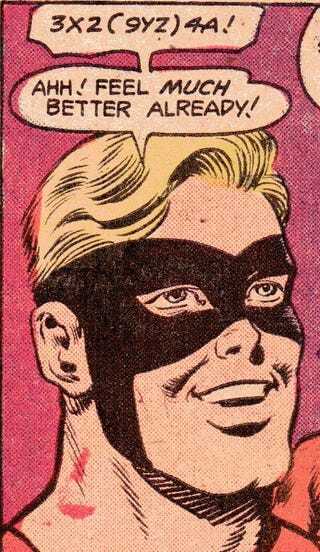 Maybe even Johnny Quick, the original user of the speed formula will never be introduced. These may just all be easter eggs for Flash geeks like me, but damn do I love them and the show runners for so intricately and masterfully placing them throughout the show, indelibly intertwining these elaborate historical comic book references into the show’s very structure and DNA. By the way, if you love last night’s episode and its crazy comic book feel, or this kind of fun Flash story complexity involving things like the Speed Force, the speed formula, other classic speedsters, time paradoxes, et. al., then do yourself a favor and pick up one of Mark Waid’s (then maybe John’s then maybe Morrison’s and Millar’s) “Flash” trade paperbacks and dive right into the oh-so-goodness.